Carlow produced a storming finish, coming from arrears of 0-18 to 0-16 on 66 minutes to hit the game's final five points and get their campaign off to a winning start at Netwatch Cullen Park. This was an all-out, pulsating championship game from start to finish. It remains a mystery as to why the game failed to produce a goal. In the opening half, Carlow spurned a host of goal chances while, after the change of ends, Kerry were frustrated in their quest for a green flag. 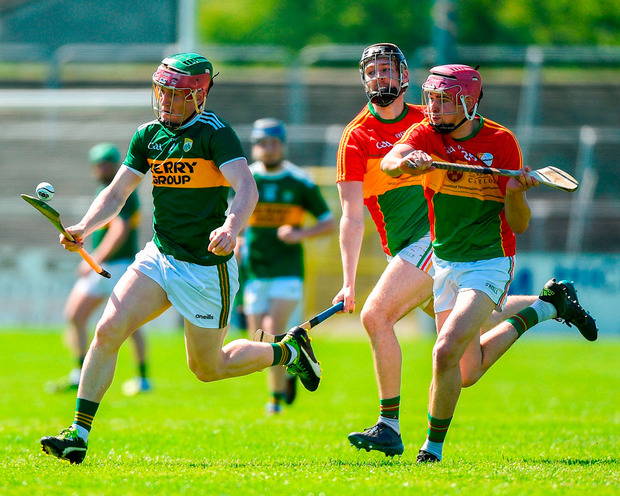 It was end-to-end stuff throughout the opening half, in which Carlow had the bulk of the possession, but while the home side was wasteful, the Kingdom forwards availed of almost every scoring chance which came their way. Colum Harty opened the scoring within 20 seconds and all 0-17 thereafter came from the Kerry full-forward line, with man-of-the-match Jack Goulding hitting 0-4 from play, captain Pádraig Boyle notching 0-7 and Shane Conway recording 0-6 from frees. 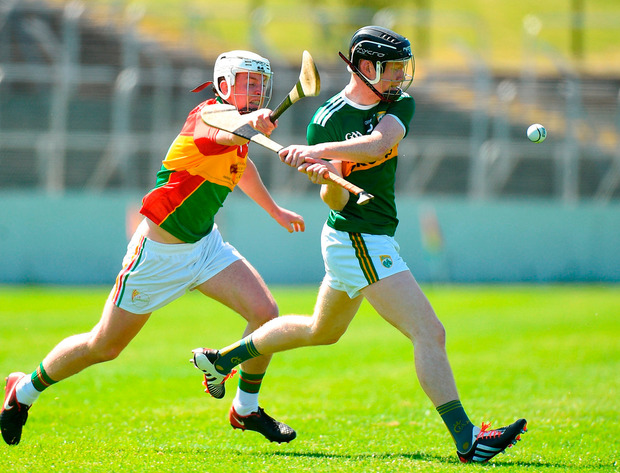 Carlow had a 0-10 to 0-9 interval lead, which they quickly extended with a point from Eddie Byrne. Jack Goulding then had the score of the match, a pointed free from a line ball some 35 metres from the Carlow goal. With the Carlow full-back line being fully stretched by diagonal balls out of the Kerry defence to their corner-forwards, Kerry looked likely winners. The introduction of Ross Smithers and Diarmuid Byrne to the home side improved matters - both scored crucial points from play, Smithers levelling matters at 0-18 apiece. And it was Carlow who pushed on with three fine points from Jack Kavanagh, Kevin McDonald and a wonderful strike from James Doyle. Kerry lost right-half-back Brandon Barrett to a second yellow card as Carlow claimed a hard-fought victory. Scorers - Carlow: D Murphy 0-6 (5f), E Byrne 0-4, J Doyle 0-3, K McDonald 0-2, D English (f), C Nolan, P Coady, D Byrne, R Smithers, J Kavanagh 0-1 each. Kerry: P Boyle 0-7 (1f), S Conway 0-6(f), J Goulding 0-4, C Harty 0-1. Carlow - B Tracey 7; P Doyle 5, A Corcoran 7, M Doyle 6; R Coady 6, D English 7, R Kelly 7; J Kavanagh 7, K McDonald 6; J Murphy 5, P Coady 6, E Byrne 8; J Doyle 8, D Murphy 6, C Nolan 5. Subs: T Joyce 6 for Nolan (46), R Smithers 6 for J Murphy (54), D Byrne 6 for D Murphy (56). Kerry - M Stackpoole 7; S Weir 7, J Buckley 7, B Murphy 6; B Barrett 6, D Collins 6, T Murnane 6; C Harty 7, B O'Leary 7; D Griffin 6, M Boyle 8, B O'Mahony 7; J Goulding 9, P Boyle 9, S Conway 8. Subs: D O'Carroll for Harty (injured) (66).